This is going to be fun! Today I am hosting the first of three live discussions at SL15B and I am super excited about this one! I am going to be joined by June Fallon who was one of my absolute blogging heroes for a long, long time and is now the creator and designer behind the brand Dahlia and Trixie Lanley from LTD magazine who is herself a stand out top class home and decor blogger with many years experience. A Place to Call Home will cover why a home base is so important to us as Second Life Residents, how decor has changed over the 15 Years and the importance of decorating to your own taste and style, plus lots more and audience questions! 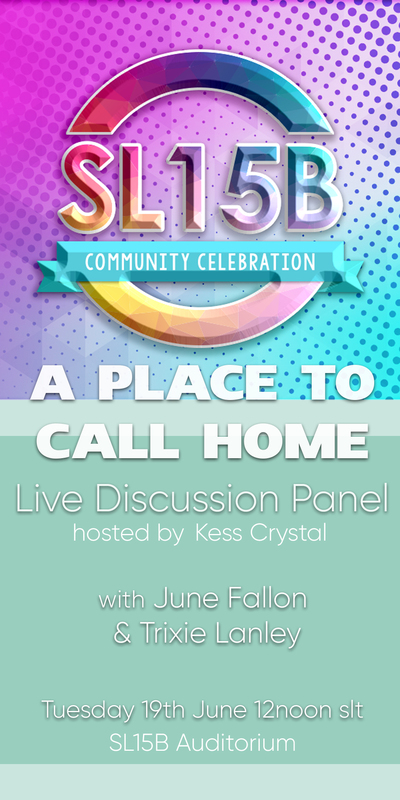 Join us today, 19th June at the SL15B Auditorium for a fun, lively discussion with two very experienced and knowledgeable members of the blogging and home and garden decor scenes in Second Life.